Perhaps it is because it stands chronologically first in my own life that the Matthäus-Passion stands first in my heart. It is conventional wisdom to prefer the Mass in B minor, an artificial composition, a catholic text by a Lutheran composer, over the more real, though not precisely traditional passions of Bach. I sang all of these Bach pieces myself, both chorus and alto solo, at one time or another, but none ever went so deep as the Matthew Passion. The Matthew Passion is a huge work that to make sense in performance needs to be gotten through with a certain amount of pace. Nikolaus Harnoncourt understands this. He seems to have conceived it as a whole. Excellent. This is also one of the 100 greatest recordings from Gramophone. I see that Dorothea Röschmann, the countess of last week's Figaro, is the Soprano II here. Christine Schäfer, whom I saw in recital in SF, is the Soprano I. Oliver Widmer is the bass II. Matthias Goerne sings Jesus. He is the one who tours singing Lieder cycles--I've seen one of these, Schubert's Winterreise--and he's quite good. Bernarda Fink is the alto. It is very good indeed. One hesitates to write about it, because with Bach one wishes only for the truth to shine through, and for mere mortals to stand out of the way. This performance is a unique personal vision. We could feel ourselves sitting in a pew in the Thomas Kirche and hearing this performance. "Here we sit with tears flowing down and call to you in the grave: 'Rest softly.'" I have not listened much to Régine Crespin. Her style is one of extreme elegance. I don't know if her Berlioz Les Nuits d'Été will seduce me away from Victoria's, but I do know that her performance of Ravel's Shéhérazade, Trois Poèmes de Tristan Klingsor, also on this recording, is very seductive indeed. I feel a perfect marriage of music and performer. Her voice and style mix with the color of the orchestra in a perfect blend. It is simply perfection. I have bought a rather odd assortment of recordings. Berlioz' Les Nuits d'été by Régine Crespin. This was one of the 100 best recordings from Gramophone and I'm anxious to hear it. This time they had Harnoncourt's St. Matthew Passion. The item that justifies my calling the list odd, I suppose, is this one of orchestrated versions of songs by Schubert. The orchestrations are by Reger, Webern, Berlioz, Brahms, guys like that, and the singers are Anne Sofie von Otter and Thomas Quasthoff, the guy who won the classical singing grammy. It should be fun. On the spur of the moment I went to see Who's Afraid of Virginia Woolf with Kathleen Turner. What a great play. It was fabulous--she was fabulous. All these London theaters are not that large. The acoustics in the Royal Opera House, for instance, are excellent. The actors in Virginia Woolf spoke in normal voices and could be heard easily. So what is this huge blast of sound in musicals about? Saturday Night Fever is basically a disco opera, and disco is nothing but loud noise, so that makes sense. And Elton John is a rock musician and probably wouldn't even think about not amplifying Lion King. But the music of The Woman in White isn't disco and isn't rock and roll. It just blasts you out of your chair to be doing it. Musicals used to be about singing just as much as opera--witness Kenny's album of Broadway songs--but not any more. If you could get gorillas to sing on tune, they could do as well as the average singer in a musical. They bellow and scream, they can't integrate their registers at all, in short, they just plain stink. We have compared notes and all agree we didn't detect amplification of the singers in Doctor Atomic, and were completely surprised to read about it in the New York Times. I'm good with that. If you can fool me, you can do it. You have my blessing. But the rest of you--just what is the attraction of all that distortion? The only really good singing I have heard outside the opera house since I came was the woman who played Rafiki in Lion King, Brown Lindiwe Mkhize, from South Africa. Incredible. She was worth the price of admission. And!!! She also got the most applause at the end. People know. Now I've got that out of my system. Wilkie Collins' novel The Woman in White is the original mystery, the first novel about crime investigated and solved. There is a strong love sub-plot which makes it eligible for musical treatment. The show requires three young English women who must look similar and sing reasonably well. The plot depends on mistaken identity, which I thought worked extremely well. My theory--I always have a theory--is that Andrew Lloyd Webber had been listening a lot to the King and I--specifically Tuptim's song and the King's soliloquy--just before he started writing The Woman in White. That is the problem with composing. How do you get all those other people's tunes out of your head? Sometimes the answer is you don't. In this show only the actors are live theater--everything else is a movie projected onto large moving screens rather like Cinerama. Some of it is a kind of "Over Hampshire" film of English countryside. You get two for the price of one--stage show and movie. Am I giving it away if I tell that the villain gets it in the end by being run over by a film of a train bearing down on the audience? Projections are a current fad in opera productions where they frequently interject irrelevant subject matter into the drama. In this musical they were used instead of sets, making for a uniquely varied and highly relevant setting. I didn't cringe, except over the singing. This is what microphones do for us. Nobody bothers to learn to sing well, and if they did, would you be able to tell? Or would the distortion of the overamplification make everyone sound bad? If I were giving it a thumbs up or thumbs down, my thumb would be a bit above horizontal. In the performance of Figaro I saw last week they all did little ornaments in the da capo sections of the arias. This has been standard for Handel for a few years, but for some reason no one before ever seemed to apply this performance practice to Mozart. No one gets too carried away about it, though. Only Cecilia Bartoli seems to ornament for its true purpose, which is to show off how spectacularly fancy she can get. For this you must let yourself go. I wonder to myself if I am not too jaded to get really enthusiastic about anything new, but reviewing my blog entries for 2005 I find that I got really enthusiastic about quite a lot. Anna Netrebko’s second aria album. Proibita, both live and on CD. Still, even now, it is Cecilia who stirs me the most. She is peaking now. It was worth hiking all around the Tate Modern to see something I didn't know existed: "The Backs" by Henri Matisse. These are four larger than life blocks of dark wood carved into the shape of women's backs. Awesome. There was a sculpture called "looking into the corner" or something like that, of bald men looking at the corner of the room and laughing. I laughed. There was another with an old VW bus and sleds trailing out the back. I laughed. I frequently laugh in museums but find myself to be the only one laughing. I urge you when viewing art to read about it in advance, to make your information gathering not part of your direct viewing experience. You should be there to take in the picture. Listening to someone else talk about it means you are seeing what they see and not your own thoughts and feelings. 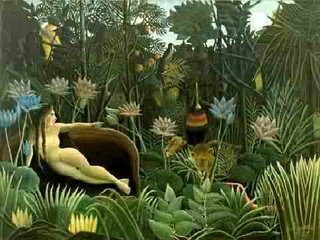 I happened to be channel surfing on Tuesday evening and came across a man walking down a row of paintings, all by Henri Rousseau, and making the usual intellectual comments that seem to be what people do with art these days. I call this the Sister Wendization of art. They drone on and on about who is in the pictures and have nothing to say about how they look. "Oh my God, someone is doing an exhibition of Henri Rousseau!" was my reaction. Naturally, they said nothing to give you a clue who this was. At the end I scanned the screen of hundreds of credits and thought I saw the word "Tate." Yes! It was / is until Sunday at the Tate Modern. I left work unexpectedly yesterday to go all the way across London to see it. Glorious. The tiger painting is now my wallpaper. I was planning to retire last month, so it isn't like they could fire me for malingering. The worst that could happen is that I would have to go home. My plane ticket is already paid for. Art is for looking. Being trained to make music teaches you exactly the things you need to know to hear music. Music is about listening, and everyone seems clear about that. No one seems to get that art is about looking. Experience the way the deep blue-greens saturate the picture, the way the snake charmer is so dark you can hardly see his/her features. Experience the way it looks. The man was a genius at creating a look you have never seen before. It doesn't matter at all what it refers to in the real world.